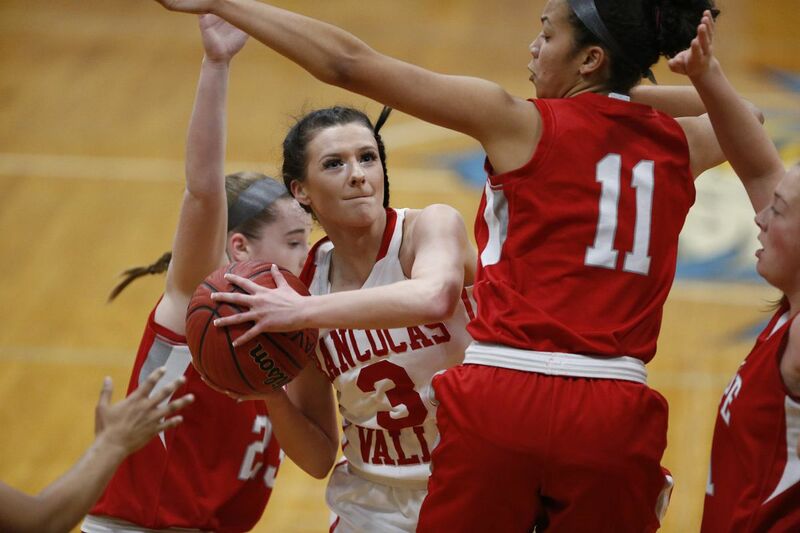 Rancocas Valley’s Lauren Lewis (center) looks to pass between Lenape’s Kendall Keys (left) and Nevaeh Sutton. The thing Lauren Lewis remembers most about scoring her 1,000th point was that it was the first time in her life she'd ever cried because she was happy. It was a layup in transition late in the fourth quarter on Jan. 22. A win at Northern Burlington. And that final layup gave Lewis 28 for the game, a career high. "I never expected to [score my 1,000th point] in that game, no one did. I just remember my teammate Jaylin VanDunk running over to me and giving me a hug and I just started crying," said Lewis a senior on the Rancocas Valley girls' basketball team. "My parents were there but no one was prepared, no one expected that it would happen that night — even I didn't expect it." The scene was another example of the way Lewis attacks her goals on a basketball court: passion combined with a ferocity that belies a fun-loving off-the-court personality. This year — like every year of her high school career — there has been an uncommon amount of adversity following Lewis, who transferred to RV from Paul VI after her freshman season. But she remains the Red Devils' steady presence. And because of it, RV remains of one South Jersey's top teams. Through all of it, Lewis has cemented herself as one of South Jersey's all-time best three-point shooters. She has her team poised for a strong run in the Group 4 playoffs and South Jersey Invitational Basketball Tournament. "Right now she's kind of the glue that's keeping us together," said RV coach Anthony Corrado. "We rely on her to score the ball for us. She's gotten better each year with her defense. And she's the one the younger kids look up to." Of RV's six seniors, Lewis is the only one who hasn't been forced to sit with injury this season. And there are still several players still not in uniform for RV. But having to weather storms isn't new for Lewis. Last year, she helped the Red Devils endure the midseason transfer of their top post player, Katie McShea, to Bishop Eustace. And in her sophomore year, she shined despite new surroundings on her new team. She stands alone in second place for career three-pointers in Burlington County history. As of Feb. 1, she had 210 three-pointers, putting her just behind former Lenape player Christina Foggie's record of 242. Foggie is one of the state's legendary girls' basketball players who was ultimately drafted in the WNBA. For Lewis, the fact that she's in position to break the record is somewhat surprising. She was a point guard until high school, not known at all as a three-point specialist. "I realized around my freshman season, 'Wow, I can actually kind of shoot,'" Lewis said. "So I kept shooting." She'll shoot by herself for an hour before each game, and that's just scratching the surface of the work she puts in on her own. That's the secret, she said, to her success. No, she didn't expect or even aim to score 28 points to reach her 1,000th on Jan. 22. But the goal was in front of her and, as she has a habit of doing, she reached out and grabbed it. "A big thing I tell my teammates is just to stay positive," Lewis said. "No matter what happens, stay positive and keep working hard. Because that's what's going to transfer into the games."